Tickle, Baked, Tango, Whip, Prince, Frat, Punk, Shaka, Boston, Shamrock, Ogre, Sniper, Kosciuszko, Kirra, Eucalypt, Tweed, Squelch, Marsh, Mustard, Two Cents, Fluoro Red and Fluoro Yellow. Superior Coverage: Thick like butter, smooth like margarine. Vibrant Finish: You got to burn to shine. Ironlak Acrylic Resin: The cleanest lines are only the beginning. UV Resistant: Standing the test of time. 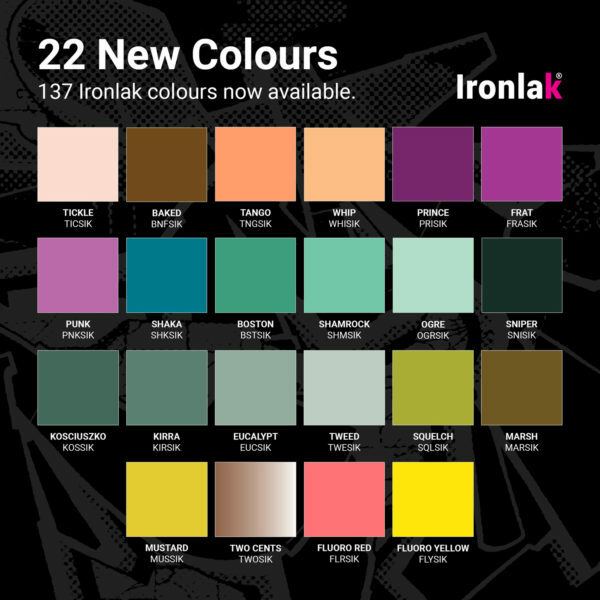 Ironlak Variable Output: More control. Less effort. Health & Environment: It goes deeper than smell.